Last fall, soon after I booked my apartment along the Arno, I decided to subscribe to The Florentine, in the hope that it would connect me more deeply to local news and events. Week after week, I read an eclectic mix of articles on everything from soccer matches to organic farming, and picked up odd phrases here and there in a regular column on the Florentine dialect, even though I couldn’t imagine I would ever be sfavato in Italy, which I was told meant “bored to death, unmotivated, unenthusiastic.” I happily scanned the ads for shops that catered to the needs of ex-pats, who by November were searching for an American-style Thanksgiving dinner, and I even perused the classifieds that sought English-speaking tutors and nannies. Shortly after Christmas, though, there was one story in particular that caught my eye. It focused on the San Lorenzo market, a place I had explored more than once. In an effort to open the piazza in front of the basilica and to make room for a new electric bus route, vendors were being pushed into streets and alleyways near the Mercato Centrale. This was an aggressive and controversial move on the part of the mayor, Matteo Renzi, a charismatic man who within months would be tapped as the next Prime Minister of Italy. For years, tourists had flocked to the market for its inexpensive scarves and leather handbags, but there were few controls on the goods that were offered for sale, and most were poor quality imports that competed with the real “Made in Italy” products of local artisans, many of whom have small workshops on the south side of river, tucked away from the city’s historic center. Sitting here now, in a plush green armchair in my tiny apartment, I’m thinking again about that article and the debate it provoked, and about Luigi Barzini’s warning to foreigners that “real life” is a world apart from the Italy of their fevered imaginations. I’ve decide to devote the entire day to a unique challenge. 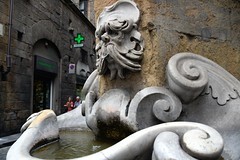 I want to explore Florence through the eyes of its artisans and I’ll do that without ever crossing the river. There will be no stroll across the Ponte Vecchio today, past the glittering shop windows of jewelers and goldsmiths, and no walk down Via de’ Tornabuoni to observe the Spring fashions of Gucci and Ferragamo. 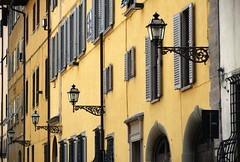 I’ve made the charming, cobbled streets of the Oltrarno my temporary home. I figure it’s time I get to know my neighbors. The name Oltrarno simply means the “other side” of the Arno River, the side that is less explored by tourists who rarely venture beyond the Boboli Gardens and the imposing façade of the Pitti Palace. After sipping a morning cappuccino at Open Bar on Via dei Bardi, it’s there that I begin, in a large, sloped piazza under a clear blue sky. 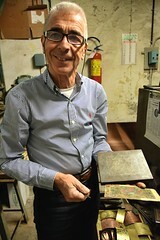 I walk first into the bookbinding and stationary shop of Giulio Giannini e Figlio, which has operated from the same location since 1856, selling a form of art that dates back centuries further, that of marbleizing handmade paper. 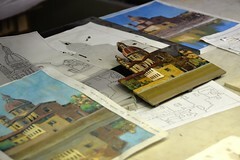 There are crowded shelves of carta marmorizzata, covering everything from photo albums to pencils to picture frames. I stand there for a few minutes, transfixed by the swirls of color that spread across the page like rows of scallop shells, and I find it marvelous that submerging a piece of paper into a liquid bath with floating dots of ink can produce patterns that are, at once, so carefully controlled and yet so strikingly unique. I follow along the sidewalk further and enter another shop, Pitti Mosaici, where I’m greeted warmly by the shopkeeper, who introduces herself as Elenora. The showroom is a stunning space, filled with fine examples of pietra dura, an Italian phrase that literally means “hard rocks,” but translates more gracefully into the art of polished stone inlay. The Medici were obsessed with pietra dura and the work of the Renaissance artists they supported can be seen all over Florence, from the Palazzo Pitti and the Palazzo Signoria, to the Medici Chapels near the San Lorenzo market. Here in the 21st century, the tradition continues. 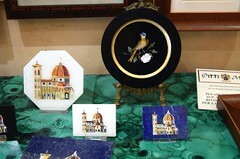 There are large tables covered in all manner of fish and flowers, and tiny plaques inset with local landmarks, including the Ponte Vecchio and Brunelleschi’s red-tiled dome. I glance about and my eyes catch hold of a beautiful circular mosaic of a bird with a cobalt blue head, perched on a delicate pink rose and set against a black marble background as dark as night. 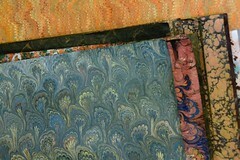 It’s a gorgeous piece, probably dating to the 1920s, she says, but I look at the price and know I can’t possibly afford it. I just can’t. We talk further, though, about this and that, and when I mention that I have a travel blog, Elenora graciously offers to take me on a tour of their workshop, which is just around the corner. She introduces me to a trio of friendly artisans who are slicing and filing and polishing slivers of marble in order to fit them precisely together, like the pieces of a jigsaw puzzle. One man is working from a pencil sketch of a rooster, while another is occupied by a pair of cherries hanging from a vine. The last is concentrating on an elaborate church, and I recognize it immediately as Santa Maria del Carmine, where I once made a pilgrimage to see a stunning cycle of Renaissance frescoes in the Brancacci Chapel. The sections of stone he has chosen have a subtle gradation of color that render the scene nearly three-dimensional, and as I look across the table at the painting he’s used as an inspiration, at his pencil sketches that translate those shapes into outlines, and finally at the stone inlay he’s produced, I am humbled. I can’t help but think that I will never in my life be as skilled at something as this man is in his art. And he’s still learning, she says. After twenty years, he’s still learning. Careful not to disrupt their work for too long, I thank Elenora and the men I’ve met for their indulgence of time and make my way back into the alley and into yet another shop, that of a silversmith named Donato Zaccaro. 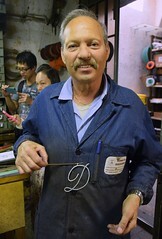 As I browse the glass cases, Donato’s wife asks if I would like to see the workshop in back. Of course, I say, and she takes me to meet Donato himself, who is fashioning a large monogram of the letter “D.” Bashfully, I explain that it’s the first letter of my name, and Donato jokes that it’s his, too. His smile is infectious. He shows me pieces of paper on which he’s penciled the letters, and how he transfers the design onto wood using a series of nails, around which he bends a silver wire into shape. As he pounds the “D” flat and holds it up for my approval, I decide to buy it as a souvenir, knowing that by the time I leave Florence in a few weeks’ time, my suitcase will be filled with them, including a lovely paper picture frame and a mosaic of the duomo. I’ve been making a mental list all morning. After an obligatory break for gelato at Gelateria della Passera, there are other artisans to visit, and they fill my afternoon happily. I explore a bead and embroidery workshop, a print maker and engraver, and a bespoke shoemaker, but my favorite of the afternoon is Giuliano Ricchi and his wife Maria, whose shop is tucked away in a quiet courtyard near the lively Piazza San Spirito. They are gracious and kind and within minutes Guiliano offers to takes me on a private tour to show me the equipment he uses to craft charm bracelets and metal boxes and business card holders, which he sells to luxury retailers abroad, including Neiman Marcus and Dior. By the time I leave, my feet are tired and my stomach is growling for dinner. I sink into a seat at Trattoria la Casalinga, where a line is growing despite the early hour, and I’m grateful when I see that a carafe of good house wine costs less than bottled water. Wine it is! The crostini with garlic and olive oil, and the spaghetti al pomodoro I order are equally inexpensive, but tasty and comforting in their simplicity of ingredients. As I stroll back towards Borgo San Jacopo and stop to the admire the 16th century fountain on the corner of Via dello Sprone—the one by Buontalenti with the grotesque mask and the large fluted bowl, a well-loved landmark on the Oltrarno—I think about what a nice day it’s been. Through all of my wanderings, I’ve etched these streets into my memory, and the short walk back to my apartment feels like going home.